Did you know that Union County 4-H is introducing its first Robotics 4-H SPIN club? 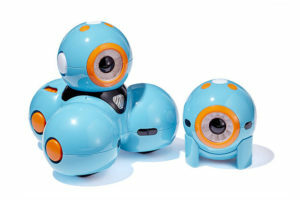 Beginning on January 26, 2019, Union County 4-H will educate youth between the ages of 6 to 11 years old how to work as a team to design real-world science and technology solutions to collaborative problem-solving challenges for Dash & Dot robots. Youth do not need experience in robotics or coding to participate in the club. This club is a great way to provide the youth with the opportunity to become engaged in innovative learning and understand the new team sport for tech leaders – coding. Coders in a team setting are able to work together to solve a problem and collectively create a solution which is similar to sports minus the football or base. This is what I love about N.C. Cooperative Extension and 4-H Youth Development. Since the program’s inception, 4-H youth have been engaged in demonstration projects that bring innovation and understanding of land-grant college and university research to local communities. Understanding and appreciating the role of science, engineering, technology, and applied math is even more critical as the needs of our society and its workforce change. Did you know that between 2017 and 2027, the number of STEM jobs will grow 13 percent, compared to 9 percent for non-STEM jobs—with positions in computing, engineering, and advanced manufacturing leading the way? 4-H Youth Development’s goal is to provide your youth with these skills. If you are interested in learning more about the Robotics 4-H SPIN club, contact 704.283.3735/704.283.3740.